As we continue to branch the Tiger Muay Thai(TMT) name worldwide and be seen as one of the most prominent training facilities in all of Asia, TMT Director, Will Elliot, has helped make that even more true by inking a deal which should result in a mass influx of Chinese fighters and guests to the camp. Tiger is collaborating with Kunlun fights, a prominent mixed martial arts(MMA) promotion in China. 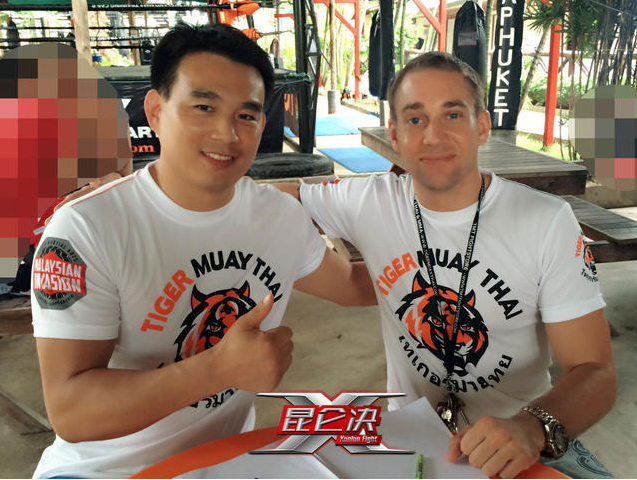 Tiger Muay Thai will now be the official training site in Thailand for Kunlun fighters and other top Chinese talent. Another aspect of this new partnership will be a raise in Tiger Muay Thai fighters competing regularly in Kunlun promotions, allowing TMT fighters an outlet to get international fights and gain valuable experience. On top of Tiger Muay Thai recently being featured on CCTV (China Central Television), and another prominent Chinese website called www.qq.com, Kunlun fights will be aired on public television in 48 countries, providing great exposure for the fighters and for Tiger Muay Thai alike. As a result of this collaboration, members of China Top Team and and The Ultimate Fighter(TUF) China finalist, JianPing Yang(6-3-1) are currently training at Tiger preparing for their upcoming bouts. Yang is prepping for his UFC debut in Macau August 23, 2014 headlined by Michael Bisping and Cung Le. Also on the card will be a welterweight showdown between Tyron Woodley and Dong Hyun Kim.